Pentax has overhauled the excellent dust-proof, shock-proof, water-resistant Pentax K-5 from 2010 with a brand new autofocus system that works in darker conditions than ever before. The Pentax K-5 II might just be the best sticky situation camera out there. Now the company has outfitted its flagship K-5 II with a new SAFOX X autofocus sensor that can find focus down to -3EVs. That's very very dark! It's also an important tweak to the camera's performance. Like all sub-$2000 DSLRs the K-5 II sports an APS-C sensor (it's a 16.2-megapixel sensor, if you must know). These sensors have gotten extremely good in low-light and high-ISO conditions across the board. What's been lagging behind image quality of the cameras is the power of their autofocus sensors, which are slow in general and brutally slow or unusable in low-light conditions. If we're to believe Pentax, the SAFOX X autofocus could at least partially fix this problem. Otherwise, the K-5 II looks to be more or less a rehash of what came before. One major question mark will be the video quality. 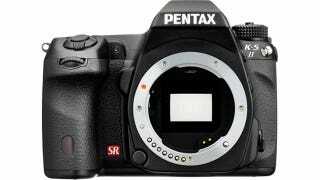 Despite the sterling image quality of Pentax cameras, their video has been a step behind the rest.